In just seven years over 1500 millers all over India and abroad have chosen mark color sorters to their products more clean and ahead of competition mark's commitment to manufacturing the best color sorter in the market is characterized by listening closely to and understanding the needs of the industry using a strong focus on design an technology coupled with the best manufacturing facility.It also enables mark to apply the most rigorous quality control throughout the entire manufacturing process. Mark Introduce the new range of color sorters smart speed,developed with our painstaking experience in color sorting field the technological advancement and of course with the ideas from the millers. Majority of the components are source from the worlds best of its kind ensuring that the components are built to give best possible performance and proven the smart speed uses high speed camera and high speed ejector valve to give quality sorting performance and minimum product loss.From 60 channels to 120 channels smart speed offers wide range of sorting capacity from 0.5 tons to 2 tons of polished rice per hour the smart speed serious color sorter gives significant performance in all types of food grains such as rice various rice varieties. 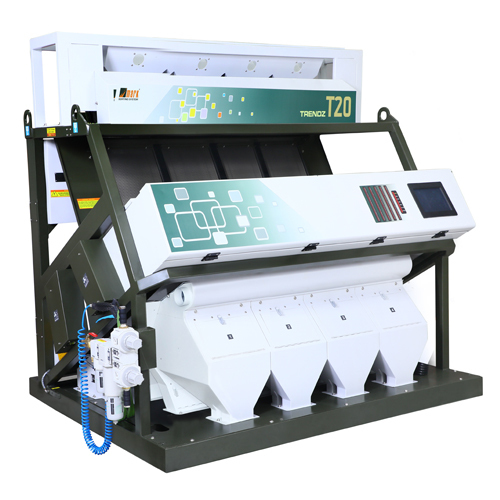 To ensure the satisfaction of our customers , we are able to manufacture, supply and export high quality Smart Speed Color Sorter. These machines has a 8mm smooth flow vibrators to ensure high performance and speed. The offered machines are quality examined and tested before delivery to ensure our clients with flawless products. We manufacture the Smart Speed Color Sorter in compliance with the international standards and the latest market trends. 2048 pixel line CCD camera - high resolution down to 0.09 mm scanning. LCD touch screen interface easy operation.